On this fourth day of Navaratri, chaturthi, I pay homage to Goddess Mahalakshmi, the Goddess of wealth and prosperity. 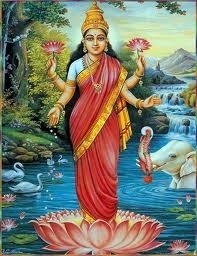 To honour her, I offer the same prayer that I have recited every morning and evening for countless years, the Mahalakshmi Ashtakam. This prayer is from Padma Purana पद्म पुराण, a religious text dating roughly between the 8th and 11th centuries where this prayer is written as being chanted by Lord Indra. I am happy to have found this exquisite dance set to this prayer. The lovely dancers perform a Mohinattam, the classical dance form from Kerala. If you would like to learn to chant this sloka, click here. शङ्खचक्रगदाहस्ते महालक्ष्मि नमोऽस्तु ते (१) Salutations to Mahalakshmi, who is the illusory power of the universe, who lives in riches and is worshipped by the divine beings, who holds a conch, discus and mace in her hands. सर्वपापहरे देवि महालक्ष्मि नमोऽस्तु ते (२) Salutations to Mahalakshmi, who rides an eagle, who frightened the demon Kolasura, who can remove all sin. सर्वदुःखहरे देवि महालक्ष्मि नमोऽस्तु ते (३) Salutations to Mahalakshmi, who knows everything, who can grant any boon, who is fearsome to the wicked, who removes all sorrow. मन्त्रमूर्ते सदा देवि महालक्ष्मि नमोऽस्तु ते (४) Salutations to Mahalakshmi, who grants intelligence and success, who gives enjoyment and salvation, whose very form is a mantra. योगजे योगसम्भूते महालक्ष्मि नमोऽस्तु ते (५) Salutations to Mahalakshmi, who neither has a beginning nor end, who is the primeval power, who is the greatest Goddess, who is Yoga and born of Yoga. महापापहरे देवि महालक्ष्मि नमोऽस्तु ते (६) Salutations to Mahalakshmi, Goddess of the macro and the micro world, who is supreme power and holds all within her, remover of the greatest sings. परमेशि जगन्माता महालक्ष्मि नमोऽस्तु ते (७) Salutations to Mahalakshmi, who is seated on a lotus, who is the personification of the Supreme Spirit, who is the supreme ruler, who is the mother of the world. जगत्स्थिते जगन्मातर्महालक्ष्मि नमोऽस्तु ते (८) Salutations to Mahalakshmi, who is clad in white, who is adorned with various ornaments, who is the mother of the world and resides in it. Those believers who chant this prayer of eight verses will gain all success and sovereignty at all times. Those who recite it once a day will have their greatest sins removed. Those who recite it twice a day will be endowed with food and wealth (prosperity). Those who recite it thrice daily will have their greatest enemy (ego) destroyed and Mahalakshmi will always be with you, happily, and grace you with blessings . Thank you very much for sharing this. It will be a good addition to my daily prayers for sure. It was good have had the chance to talk to you. Hope to see you soon…..